The Cycle Solutions Team had a great couple of days at this weeks Employee Benefits Live show at Olympia. The annual event attracts senior HR and Rewards professionals from hundreds of organisations across the UK and Europe. This was the first year that the conference and exhibition was held at Olympia, following a decision by Employee Benefits magazine to move the event from the smaller Business Design Centre. The Cycle Solutions team were taken aback with the level of interest in the cycle to work scheme at this event. National Account Manager, Anthony Coker, was impressed by the quality of visitors to the Cycle Solutions stand; "This was the fourth year we have exhibited at the show, and each year we continue to see more and more employers who are interested in our cycle to work scheme." "With so much interest in cycling at the moment, pretty much everyone we spoke to at the event is either running the cycle to work scheme for their employees or plans to launch the benefit at some time in the next few months." 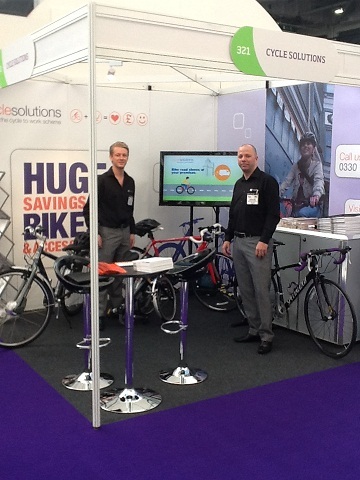 We would like to thank all of our Cycle to Work clients who visited us at this years event. We met loads of new organisations and will be following up over the next few days and weeks. We hope to be out to meet with you all. In the meantime, feel free to call in on 0330 100 2480. It will be great to hear from you.